An in-depth report into the consumption of cats and dogs in China has revealed the nation is not a country of cat and dog eaters, on the contrary, many areas see up to 80% abstaining. A side effect of the high profile nature of the industry - due to reports in the western press - is that dogs and cats are often believed to be a Chinese staple. 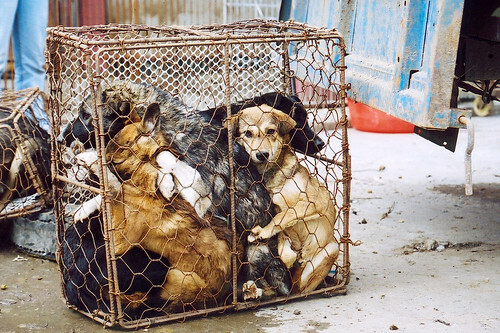 But Animals Asia’s report into habits and attitudes towards the consumption of cats and dogs in the country reveal that eating dog meat is a minority activity. 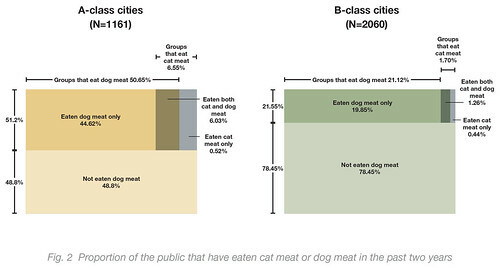 In cities where eating dogs is less prevalent (B-class cities), only 20% of respondents had eaten dog meat in the past two years. Even in cities with the habit of eating cats and dogs (A class cities), almost half of respondents had not done so recently. 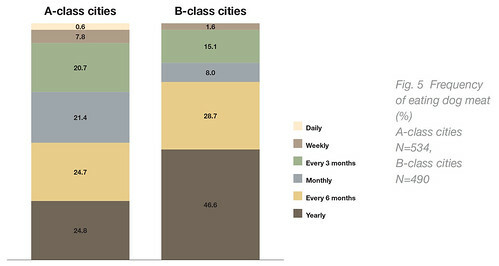 Note: A-class cities: where dog meat consumption is more common; B-class cities: where dog meat consumption is rare. 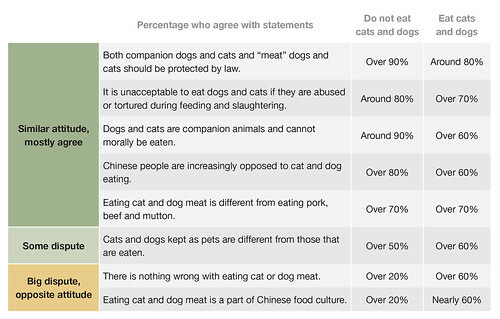 Whether in dog meat heartlands or areas where canine consumption is less common, support for banning the slaughter of dogs and cats for consumption was astonishingly high – rising to around two thirds (65.4%) among those who don’t eat dog. The statistics are published today as part of a far-reaching report commissioned by Animals Asia into attitudes towards the consumption of dogs and cats. More than 3,000 people aged 18-65 were polled from 19 cities around the country. Animals Asia’s report reveals that even among those who do consider dogs and cats to be food, the majority only partook once or twice a year – most likely during special occasions. Those who say no to dog meat cite the inherent cruelty of the industry, their believe that cats and dogs are friends not food and poor sanitation as the main reasons. Despite the fierce debate surrounding the slaughter of dogs for human consumption, polls revealed that attitudes among those who do and do not partake to be broadly similar. Both camps overwhelmingly agree that abuse and torture of dogs destined for the dinner plate is unacceptable and that the law must protect all cats and dogs, whether domestic companions, or reared for consumption. However, strong disagreement was seen on the issue of cat and dog eating being part of China’s gastronomic cultural heritage. With criminality exposed throughout China’s dog meat industry, the public are becoming increasingly worried about a trade serving the few, but harming the many. Opposition to the industry has reached fever pitch in recent years, with stories of illegality and violence regularly making headlines in local papers. Such is the depth of feeling against the corrupt trade that in March this year, nearly 2 million Chinese took to the internet to support a bill that would see the practice made illegal in their country. “The evidence against the industry is becoming overwhelming and now the weight of public opinion can be added to the long list of factors aligned against this cruel trade that is rife with crime. This is the occasional habit of a minority – yet the whole country suffers from the crime and health risks. It certainly looks as though China is getting increasingly closer to saying ‘enough’ and ending the cruelty on its doorstep." If China did decide to end the trade, it would become the latest in a string of Asian countries to take cats and dogs off the menu, the most recent being Thailand in 2014.